The Hubble eXtreme Deep Field (XDF) is an image of a small part of space within the constellation Fornax showing the deepest-ever image of the sky –maybe the most zoomed-in photograph ever–. Released on September 25, 2012, the XDF is a follow-up to the famous Hubble Ultra-Deep Field photo created in 2004(*). 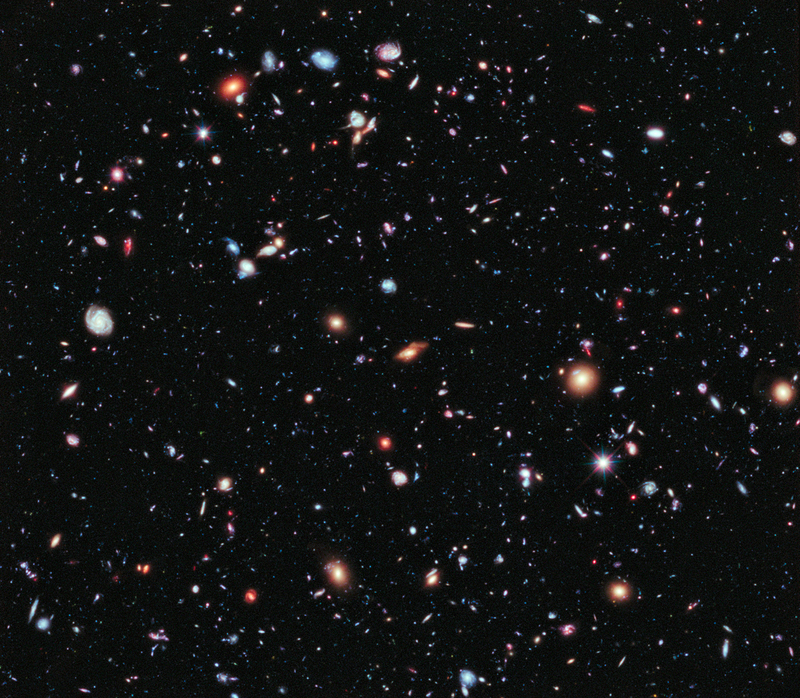 The XDF was assembled by combining 10 years of NASA Hubble Space Telescope photographs taken of a tiny patch of sky at the centre of the original Hubble Ultra Deep Field, with a total cumulative exposure time of two million seconds, or approximately 23 days, which resulted in 2,000 individual photos showing the same little section of the sky. The XDF contains about 5,500 galaxies even within its smaller field of view. The faintest galaxies are one ten-billionth the brightness of what the human eye can see. Looking deeper into the universe also means peering farther back in time. The universe is now 13.7 billion years old. On December 12, astronomers announced they have seen the further back in time than ever before and have uncovered a previously unseen population of seven primitive galaxies that formed more than 13 billion years ago, when the universe was less than 3 percent of its present age. The newly discovered galaxies are seen as they looked 350 million to 600 million years after the big bang. Their light is just arriving at Earth now. One interesting idea related to deep-space pictures and universe size (finite, no borders) would be: are we going to be able to see our own galaxy in the past?… what do you think? A nice question whose answer can be traced back to the very basic questions raised by our present model of the universe. To the best of my knowledge, there is yet no conclusive answer on the topology and future evolution of our universe. The shape found to fit observational data according to cosmologists is the infinite flat model. In that model, no chance. But even if the universe was closed, given its current size and expansion rate, the light of our own galaxy would not reach us back again, which by the way, it will be a real pity! But don’t despair, we still have plenty of possibilities in multiverse theory: there might be a parallel universe where that is possible!